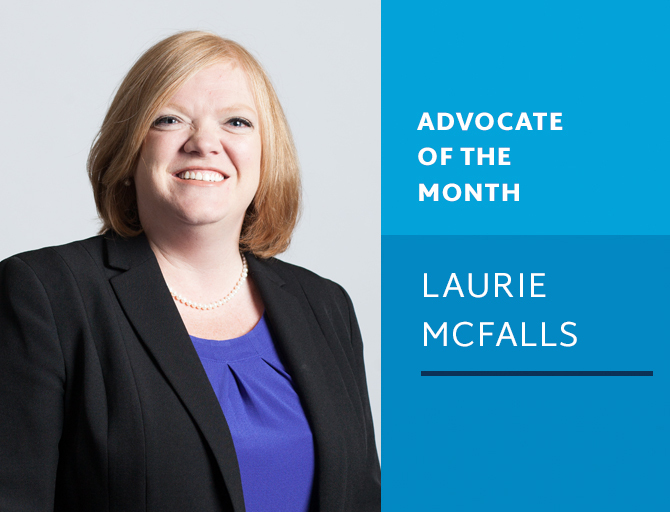 Our February 2019 Advocate of the Month is Laurie McFalls. Laurie first joined LSA as part of the Tuscaloosa office, providing legal help to tornado victims in 2011. In 2012, Laurie transferred to the Huntsville office where she currently works in a wide range of areas including: consumer, public benefits, housing and domestic law. Laurie is a member of LSA’s High Impact Litigation team as well as being Lead Attorney for LSA’s education practice group. Since starting at LSA, Laurie has proved herself to be one of the hardest working and accomplished young attorneys with the program. In February, Laurie proved this once again by helping a large number of people with a wide variety of problems. In February, Laurie helped a family retain their housing when they were threatened with eviction for failure to pay illegal late fees. Because of Laurie’s intervention, the family avoided being homeless and were only required to pay the amount they truly owed to the landlord and remain in their home. In another case, Laurie also helped a client seeking a divorce get a fresh start. Laurie helped the client get custody and the child support necessary to start a new life. In two cases, Laurie successfully represented clients in cases where debt collectors attempted to garnish wages from her clients. In one case, LSA’s client was illegally garnished by a company that lent them money online. In that case, Laurie had to convince the client’s payroll office that the lender could not garnish a paycheck without getting a court order. In the second case, Laurie helped a client avoid a garnishment which would have been devastating to their families. Finally, in February, Laurie helped three clients to deal with the consequences of evictions. In each case Laurie helped the client to get the time they needed to move and also made sure the client was able to relocate without owing any money. LSA is very proud of Laurie, and we are so excited for the work she will continue to do. Way to go Laurie, and keep it up! Very proud of you Laurie. Congratulations.